With the hottest days of summer also comes some of the best terrestrial fishing of the year. Ants, bees, hornets, grasshoppers, inch worms, and beetles are abundant and often end up in the water. Never mind how they get there, the important thing is that these bugs fall in the water and the fish eat them. Of all the options, ants probably provide the most consistent fishing while hoppers and beetles provide the most exciting fishing. Let me explain. Ants fall into the water throughout the warmer months. 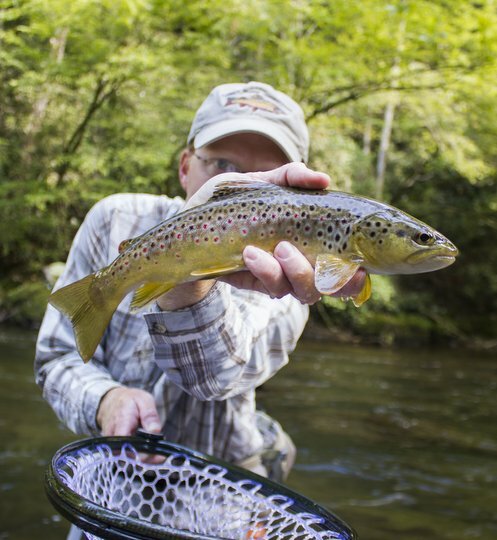 In fact, fish can be caught on ants in the Smokies almost year round and certainly from April through October. This includes some of the larger brown trout a few select Park streams are known for. 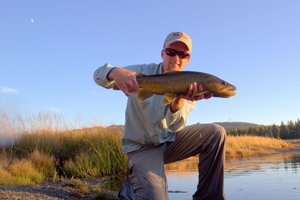 Subsurface offerings are usually the most consistent both in the mountains and on area tailwaters, although you will occasionally catch some really nice fish on top as well. Hoppers and beetles, on the other hand, provide visually exciting sight fishing to wary trout, often in shallow water. Fish will usually eat a beetle given the opportunity. Hoppers are not far behind, but knowing your local water is important here. 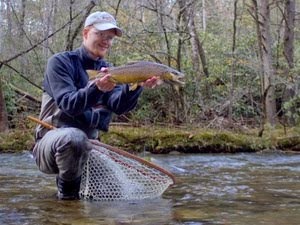 For whatever reason, there just isn't much hopper fishing in the Smokies. Not that you can't find a few fish willing to crush one, but that is definitely the exception rather than the rule. Beetles seem to be rather widespread however. I had this reinforced just a couple of weeks ago. After a half day day morning guide trip, I decided to hit the water for a couple of hours to see how the fishing was on Little River. My goal was to either fish streamers or terrestrials with a strong preference for the terrestrials. Streamers are better in the winter, or at least that is when I prefer to fish them. Beetle fishing is best during the heat of summer once the Japanese beetles make their annual appearance. I made my way up to the river after a stop at Little River Outfitters and was soon looking down at a nice pool. Sure enough, a quality brown trout was resting in a favorite lie in the back of the pool. This is a prime spot because it is accessible and easily approached without spooking the fish. I rigged up with my favorite black beetle pattern and dropped into the stream well downstream of the fish. Working slowly up the bank, I snuck into position behind a boulder just downstream of the trout. Pulling enough line off the reel, I made a quick false cast and dropped the fly into the water just to the right of the fish and....nothing. Another cast looked perfect but the fish didn't even seem to know the fly was there. The third cast, well, the third time is a charm. The cast was about two feet upstream of the fish, and it rose confidently and ate without any hesitation. The hook set was clean, and while there were some tense moments during the fight, I soon had the fish in my net and ready for a quick picture. My day was made at this point. Sight fishing is my favorite thing to do in fly fishing so I was content. Thankfully, I didn't stop at that point. My next stop was a pool that had several quality brown trout in it, at least it did as of a few months ago. I already knew where the fish should be but couldn't spot anything from my vantage point. Regardless, I wanted to throw a few casts so I scrambled down another bank and worked my way across the riffles downstream to get into position. Moving up, the first cast was right where it needed to be. 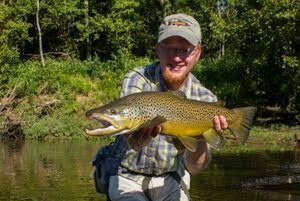 Sure enough, a nice brown was waiting for me. This fight was less stressful than the last, but it was still satisfying to slide the net under another healthy fish. While the day had been made twice already, I decided to try one more spot. Working up a rough section of water, the fish I had gone looking for didn't seem to be home. Not far upstream, I was ready to call it a day. There was a good rock wall where I could climb out, and I started up. Just as I hit the top, I glanced upstream and notice a shadow near the bank. Sure enough, another nice brown trout was sitting out just waiting for me. A few casts later, I had my third quality brown trout in the net. Not bad for an hour or two of fishing with minimal expectations. I decided to call it a day before I pushed my luck too far. The stream had been more than generous, and I was satisfied. The key to summertime beetle fishing is presenting the fly to the correct water. This seems obvious, and yet two of the three fish I caught were in water that most anglers would have overlooked. These mid-summer terrestrial eating fish are usually in shallow or shaded water (or both), often in "dead" water that most people don't even expect to see a fish in. Success is much higher if more time is spent looking than casting. Yet, for those who are patient, this pinnacle of fly fishing sport is a lot to offer. Rainbow and brook trout will also eat beetles well this time of year. One word of caution is needed here. Water temperatures in the lower elevation brown trout streams are often getting higher during the day than an ethical angler should fish in. Please carry a thermometer and curtail your fishing activities if the water temperature is 68 degrees fahrenheit or above. My personal cutoff is 66 degrees and above. If you do find warm water, simply look higher in elevation for your fishing experience. Good fishing can still be had through the hottest part of the summer for those willing to explore. 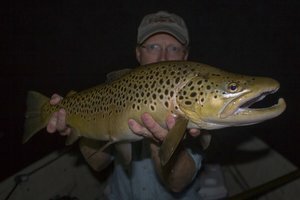 If you are interested in learning more about beetle fishing in the mountains or on the tailwaters, I offer guided wade and float fishing opportunities across middle and east Tennessee. 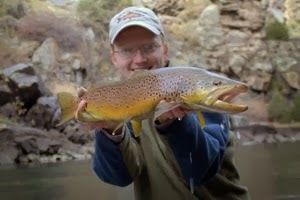 Please visit my guide site for more information on guided fly fishing trips. I've been interested into fishing and your tips for beetle fishing is really helpful for me and for those who are just learning to fish. Thanks for sharing this great post.